Before leaving Kathmandu, I went to Boudhnath to walk a couple of clockwise koras around the stupa. A Buddhist mecca and all around inspiring place, a visit to Boudha is often the perfect way to begin or end a journey. More than one mountaineer has spun prayer wheels here, believing the gesture is an auspicious start to a Himalayan expedition. My morning at Boudha was a lovely one. The dome was lit like a half-moon in the early sunlight. Tibetans were already out in force, shuffling around the monument with prayer beads swaying from their fingertips. Some offered marigolds and tika powder to Buddha statues; others crawled on hands and knees, an act of both reverence and self-renunciation. All around the stupa, prayer flags hung illuminated, rows of oil candles switched and burned, travelers composed photographs, and clusters of birds pecked breakfast from walkway cracks. Everyone seemed possessed by a private mission, with a personal prayer, their own reason for being there. Including me. At noon I had an appointment to meet a new friend at the Boudha entrance. James Hopkins is an American now living in Nepal. He’s carved a full life for himself, undertaking seriously Buddhist studies under a respected Rinpoche. He has other reasons to be there as well, having lately grown attached to a particular community near the stupa: A village of beggars and among the poorest people in already-impoverished Nepal. They live on very little, calling canvass tents “home” and procuring whatever food they can by shining shoes and extending their empty hands on the streets. Frankly, the place sounded depressing. But James lit up when he talked about the village and was eager to introduce me to the community before I left Nepal. After leading me down a side street, he took a sharp turn into a cloaked alley. The trash-strewn passage soon opened up to a field. In the field were rows of tents–a whole neighborhood cobbled together with tarps, fraying string, and knobby wood poles. When we entered the “house” of his good friend Bhimla, we were greeted with sparkling eyes and love. It wasn’t long before we were sitting among the family with biscuits and tea. There is no doubt that James is a friend of the tent-village. Among other things, he’s helped them start a small industry. Using scraps of old saris and salvage fabrics, they hand-stitch quilts of the most spectacular colors. James sells these $140.00 a-piece–the exact amount of money needed to send one of the village children to school for one year. His hope is to leverage them from a life of begging by putting their inherent skills and creativity to use. What struck me about James’ interaction with the villagers is that he obviously doesn’t feel sorry for them. And he shouldn’t. To my surprise, the village is truly a happy place, full of laughter and fun. And against what would otherwise be a backdrop of bleak brown and army green tarps, the half-made quilts and bolts of fabric offer streaks of jubilant color and hope. I will post contact info for the project very soon. I encourage everyone to consider buying a quilt as a Christmas gift! It seems silly to complain about the misery of airline travel–even with the lack of leg room, the sterile air, and the bad food; One hundred years ago the same journey around the world would have taken much longer and been fraught with danger. Still, I found my 40-hour commute from Kathmandu to San Francisco to be punishing: like tossing two days, four countries, six meals, and twelve time zones in a blender and punching the grind button. My circadian rhythms collapsed, digestion ceased, and brain short-circuited. 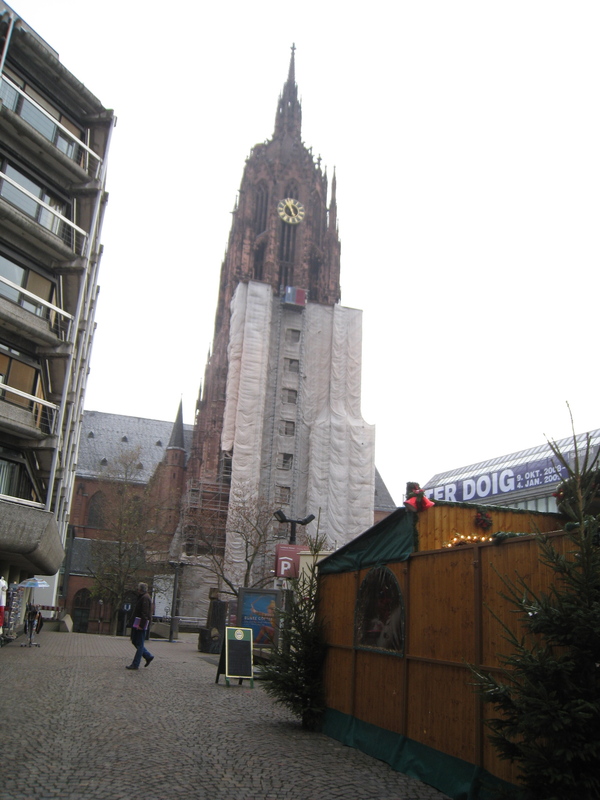 The reprieve, though, was an 8-hour layover in Frankfurt, Germany. At the airport, I approached a ticket attendant for a good, easy-to-get-to cafe recommendation. He scribbled on a piece of paper: Cafe Karin, Hauptwache Station. Driven by dreams of gourmet rolls and good cheese, I managed in my delirious state to purchase a subway ticket to the center of town. Even if I got hopelessly lost on the rails of Frankfurt and never found Cafe Karin, anything would be better than languishing in the departure lounge eating mentos and reading O Magazine. After pulling out of the airport station, the train entered a stretch of woodlands. It felt nice to travel across solid ground again, to touch the earth. I pressed my face up against the cold window glass and stared out into the bare-branched scenery: the sky was deep gray and tree after tree passed as the train coursed toward the low sun. Something in me stirred: Looking out into the snow, I realized that I hadn’t had a winter in so long. There was a moving bleakness to the equinoctial landscape–a sublimity that only comes with some touch of decay. It was a feeling that I’d long forgotten about, having dodged Decembers with margaritas on Mexican beaches, and spent summers eating August tomatoes on the hot Ashland farm. The life I had lately crafted for myself was one of eternal sunshine. I slumped back in my seat, surrendering to a visceral awareness of being awake too any hours. Other passengers climbed on the train, Germans mostly, in long coats, snug scarves. As they talked among themselves, their voices to me sounded like breaking icicles. I felt invisible among them–a person with no name, no family. A presence suspended: between homes, between places. I jumped off at the next station. On the platform I asked a woman for directions. A man overheard me asking about Cafe Karin. He knew it well–it was next door to his dentist’s office. His name was Dierk and he would be happy to take me there, even buy me breakfast. He was quick to assure me that he was a decent man. “Now mind you I have a wife and kids, a grandchild on the way,” he explained as we climbed the steps from the subway platform. The skyscrapers of downtown Frankfurt towered above us as we walked. Cafe Karin was bright, simple, clean, and so novel after two months of Nepal’s dingy teahouses. In German, Dierk placed our order and we settled in. He gave me a brief rundown of his life: that he worked for Lufthansa Airlines and had traveled much. In retirement now, he carried a lighter workload, schooling flight attendants in the intricacies of wine. The waiter brought us coffee in big decadent mugs. To my utter delight, a basket of rolls arrived: I never knew croissants could sparkle. Fresh fruit came next, followed by a plate of cheese that–after interminable days of rice and potatoes–seemed an apparition. But there it was: rich brie, flavorful vegetable cream cheese, Gouda. After breakfast, Dierk led me around the corner to Goethe’s house-turned-museum. “Okay smile!” he pulled out a camera and snapped my picture. Dierk herded me toward the door. We only had an hour and much to see. In the gift shop, he bought a few interpretive pamphlets, handed them to me, then rushed me out. Soon, we were in a square. He placed his hands on my head and directed my gaze toward a large building. “That,” he explained “is the site of the world’s largest book fair: Frankfurter Buchmesse.” He snapped my picture. We went inside and looked at a few hanging photographs of old Frankfurt, the scores of old elegant buildings before they were destroyed by World War II bombings. Before I knew it, he was dragging me toward the door of a cathedral. We entered and walked along the perimeters. Looking at the gory crucifixion statues and ghostly stone renderings of the virgin Mary, I realized that as strange as the elephant-headed idols of Nepal’s Hindu temples seemed, this –though more familiar– was pretty strange, too. Dierk rushed us into the gift shop, grabbed few more informational pamphlets, and shoved them into my hand. Next we dashed toward a market, passing along the way the old ruins of a bathhouse, leftover from the days that Germany was part of the Holy Roman Empire. We ran through the market, taking in a visial blur of color: stacked peppers, bouqets of herbs, baskets of mushrooms, shelves of wine, fans of fresh cod, shrimp over ice. “Smile,” he said, and snapped my picture. And, then, that was it: it was time to go. My whirlwind tour was over: we’d covered a thousand years of history in two hours. Dierk hurried me back to the station, gave me a hug and I climbed back on the subway to continue my strange passage. Only now I felt visible, real again: A person with a name, and a friend.